3 WHeeLeR WoRLD-Fastest ThreeWheeler, EVER! Whoa! Holy Smokes, check this thing out! 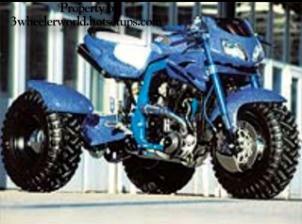 Its a Suzuki GSX -R750, Except its got threewheels, and 200HP! A French Firm named "MotoMate" created this monster. Yes ladies and gentlemen, a FIRM, not an individual created this monstrosity. MotoMate removed the entire frontend and swingarm to prepare them for the solid axel design, and a wider front tire then the once streetbike had. New tripple clamps where machined to accomodate the wider front tire. New disc brakes, and six piston(!) calipers got this thing to stop. A Turbo sits on the right hand side, just below the radiator. The stock GSX R's make around 112hp, the power was increased by about 80 to make the total horse power just a shade under 200. The rear swingarm uses a solid rear axel, like on any of the sport quads, or trikes (With the exception of the Kawasaki KLT's wich have a differential for whatever reason). The swingarm had to be machined for the new axel to fit also. It also has a Ducati seat. From just looking at this thing, I know without a DOUBT this is the fastest threewheeler ever. I do know one thing, I would want one helluva life insurance Policy before I jumped on it. All I can really say is...Wow! Also, I need to Thank Robert from Street Bike World for letting me use this picture, Thanks Robert!